I have seen this come up in a bunch of other posts, it is always getting mentioned in feature requests. This post is just to show there is a consensus that the missing zoom feature is big flaw and encourage it to be the top priority on the next update. So +1 to get the zoom. +1 I love the responsiveness of the penultimate app, however, until the zoom feature is included (or select-resize) I can't move to this app. Please incorporate this feature! +1 Here too. I really like the automatic sync to Evernote but for now, Moleskine App is used for handwriting because of the zoom feature. I can't imagine using this app for anything serious without a zoom feature. I can see using it for basic reminder notes, but nothing for business. It's just a toy at this point. I would also like to add my +1. Penultimate writes beautifully, but there is absolutely no way anyone can write naturally without a Zoom Mode. Unless of course you normally write with your hand hovering in the air! I currently use Noteshelf as it writes well and its Zoom feature is very good. All of these features can be found in Noteshelf if you want to see them in action. +1 please! I use NoteTaker HD and this feature is essential (with auto-advance). Also, the ability to rotate the page from landscape to portrait without having to change paper type. +1 There are a few features missing which make Penultimate and Evernote just not useful. Need the zoom box, text box for typing in notes and wrist guard so my hand doesn't have to hover magically over the iPad. Some good feedback - hopefully Evernote will listen and implement. Note that the palm rejection is automatic and seems to work quite well (there is no greyed out zone like other apps). The Zoom feature is a must-have (+1 to the suggestion). I love Evernote Sync, but Note Anytime and Moleskine are far more usable because for the Zoom Mode. I wonder if this something patented or so, but Penultimate would sweep competition if it incorporated it, IMHO. Lack of zoom is a nonstarter for penultimate. I have tried half a dozen note taking apps. Penultimate is the only one without this feature so I can't understand why they can't figure it out. Does anyone from evernote read these boards? I love Penultimates features and it's integration with Evernote but until zoom comes to pass, it cannot be used. I post this with the hopes that penultimate reads these and is working in this needed feature. It doesn't work well at all for me. First you have to make sure your stylus touches the screen first, then rest your hand. Even then there are still random lines and squiggles where my hand has been. Maybe it's just my giant hands! With a zoom window, I can rest my palm on my desk. Since the zoom window (should) adjusts left or right and next lines, I don't have to move my writing hand much at all. A zoom feature is essential with this kind of app. Even with a stylus it's impossible to do any kind of detail! I've been trying to move to evernote for everything for a while, and without a zoom feature, penultimate is the block for me right now. So a big plus-one from me! I use the whole family of Evernote as a premium member on a daily basis but can't handle Penultimate without the zoom feature. I use NoteShelf instead at the moment. I assume this would automatically include a wrist protection feature as well if possible? +1. Also, the wrist position settings don't get remembered so every time I go into the app I have to select them again. as many others here said before. without a zoom this app is not useable in any way, otherwise it would be a neat app for notes being synced with my evernote-account. +1 for zoom. I can't/won't use PenUltimate without it. Can someone from Evernote at least advise whether a zoom feature is on roadmap or an approximate timescale? I don't want to start using another product only to find that Penultimate is updated shortly after! yes, I've been waiting this long! +1 from me, I am still using Noteshelf but would love to use Penultimate instead. -100, zoom would absolutely ruin it. Let's not make developers waste their precious time adding useless functionality. - No PDF import for mark-up -- really?? I have been using Notability primarily, via Noteshelf, Notes (Passport) and Noterize. Notability just worked well for me for the most part, but its wrist protection (non-zoom mode) was not good. Recently I changed to Notes Anywhere - the best wrist protection, again non-zoom, is very functional, cross platform, exports to EN, but unfortunately no audio. Just getting started with it at his point, but it looks like I'll stay with it until -- Penultimate Gets Fully Integrated into EN. Oh yeah zoom - this will have to addressed and in a cross platform manner. As has been said Pen is the only significant note app without it. This what I envisioned when EN bought Penultimate and I can't wait!! +1 The zoom feature please. +1 also… a zoom feature including both full page zoom for sketching, and handwrite zoom zone like Noteshelf and many other serious handwriting note taking apps is absolutely mandatory for Penultimate's future… even though it outclasses other apps by its superb interface and sync with Evernote, Penultimate is worthless without real handwriting and fine sketching feautures… Zoom, ZOOM !! Please !! Really hard to understand how the zoom feature is not incorporated. This has been a request by many for so long and standard on most other writing apps. I continue to use Upad although I would switch in a second as a pro Evernote subscriber. Just got back from a conference where Evernote was featured by a presenter on how to incorporate technology into finance. Several us of use evernote religiously and the big complaint was the lack of zoom on Penultimate. Anyone from Evernote care to comment? Sure seems like developers at Penultimate decided early that they would not incorporate zoom and are stubbornly sticking to their guns. Sorry guys. It's a necessary feature for detailed notes that many of us in the business world are using. I can't have notes with only 20 words per page. I also bought it, but it's gathering dust because it doesn't do zoom. That said, integration into EN would be preferred for me too. Any hint if that's where you guys are heading? A little transparency would be appreciated. Penultimate was sort of abandoned since Evernote acquired it which is quite sad. I'm highly expecting a revamped version for iOS7 with all sorts of enhancements we're waiting for. Yes this is needed, was need a year ago. I am a long time user of Note Take HD... and now moving to Noteshelf (in preparation to use the Jot Script pen). Until Penultimate features a zoom similar to these other apps, it is pretty useless. Notability has it PERFECT when it comes to handwriting. If Penultimate had zoom and a palm rest, I would use it almost exclusively. Really, I wish Evernote would just buy Notability because honestly - they have it spot on. If I could have evernote integration and handwriting recognition in that... wow. My head would explode. I want evernote to be my go to for keeping track of my work notes but without the zoom feature that Notability has I cannot use it. I love the evernote sync and OCR but with penultimate my wrist makes marks even with wrist protection on and sometimes the app goes haywire. "With Penultimate's new Zoom feature, the interaction between app and stylus becomes dynamic"
So... who wants to buy me a $75 stylus? Because I'd love to, but... yeah, not really. I just got a Bamboo and I love it - and that, to me, was expensive for a stylus. Works great with zoom feature on notability. Can Evernote please just give those of us who are fine with our squishy tipped styluses a zoom feature in Penultimate? If you made it happen with the Adonit no reason you can't just add it to the app as a manual trigger. I was taking that to mean we'd all have zoom on or before the Jot Style's arrival. If they're adding zoom, it'd be a pretty raw deal to require a Bluetooth accessory to activate it. I'm sure you're going to get tons of complaints about the price of the stylus. But all I have to say is... THANK YOU! It's going to be worth every cent if it adds a zoom feature to Penultimate with the features described. Looking forward to testing it out. I just pre-ordered. I tried the new zoom and it leaves shadows on my page and writes off to the left of the pen. The wait was a big dissapointment. I *think* that's normal.........mine does it as well. The shadow is giving you a full view of what you have inked. When you zoom back "out" the zoomed ink overlaps the shadow ink. Pretty cool. Still testing. The shadow is a 'feature'.. which I have grown to like today. The bug, which I wonder if you are referencing, sometimes where I place my stylus and where it THINKS my stylus is, becomes offset. I have to zoom out and in a couple times to get it to work right again. Seems like a glitch. The new "zoom" feature is NO GOOD! They are going to have to come up with something better. 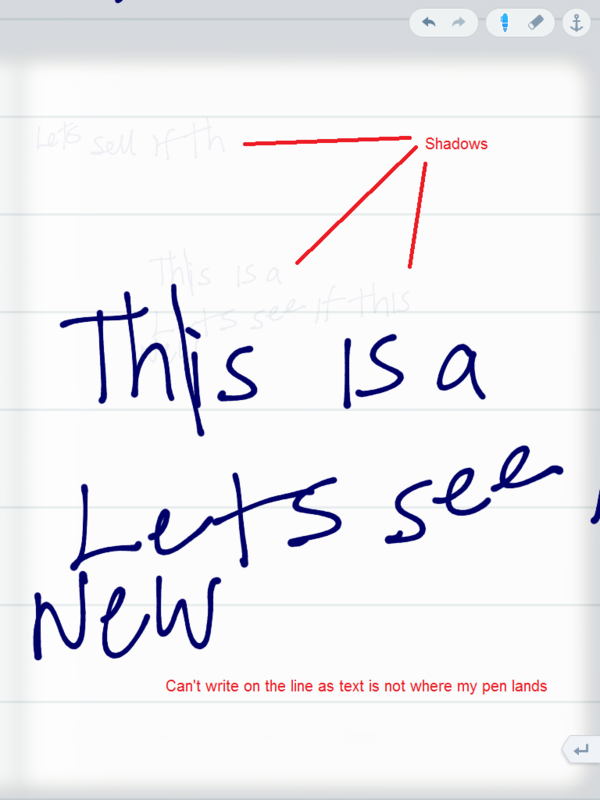 I still can't make the switch from UPad, by far the best handwriting app out there! Please, please, please make the zoom feature usable so I can finally keep all my notebooks synched through Evernote. On a positive note, I do like the automatic scrolling of the page as you write. Update: I don't like the scrolling feature as much now that I have tried using it several times. It distorts my handwriting a little and I don't get a chance to dot my i's and cross my t's! In short, go back to the drawing board and try again. A page zoom is a poor substitute for a writing zoom. Colour me unimpressed; this zoom feature is inadequate to the task. @torgerson, i disagree on the shadow feature. I don't need it to know what i am writing. Not sure if i am fond of the auto scroll wither. Seemed like a smart idea, but in using it i have noticed it affects your handwriting as you write a letter and it scrolls, you end up elongating letters to the right. This was obviously poorly tested before launch. Going back to using Noteshelf.